I just found another platform to make money online called WonDough. Is it a scam or a legit opportunity? I decided to join the website and give you my honest opinion in this review post. By the way, if you want to discover the same method that earns me $900+ per month from my laptop, check out my #1 recommendation. 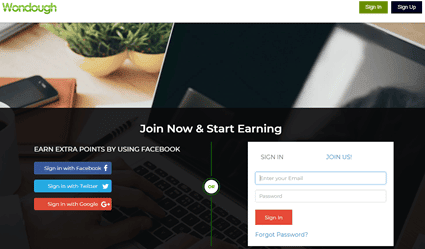 WonDough is a GPT (get-paid-to) site that allows users to make money by answering surveys, completing offers, shopping, watching videos, and more. It’s similar to many other platforms such as Prizerebel, Swagbucks, and Squishy Cash, but with fewer opportunities. When you complete a task, you earn points that you can redeem for gift cards from brands like Amazon, Starbucks, and Wallmart. The platform is relatively new and operated by Admedia, an advertising company based in California. There are very few opportunities available depending on your country. There is not much information in the FAQ. As with all GPT platforms, the registration is free and straightforward. You just have to sign up using your email address or a social media account like Facebook, Google+ or Tweeter. The FAQ says that upon joining the site, you will earn 80 wondough ePoint, but I didn’t receive the signup bonus as promised. It’s good to know that each point is worth $0.01 when you convert them to eGift Cards. 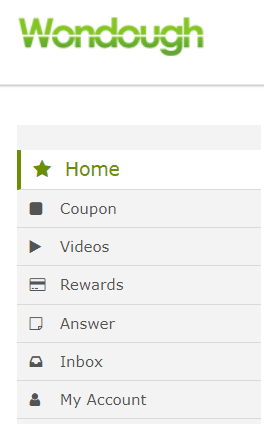 The platform offers different ways to earn points divided into sections that you can find on the right menu. Next, I am going to show you what you can expect from each section. 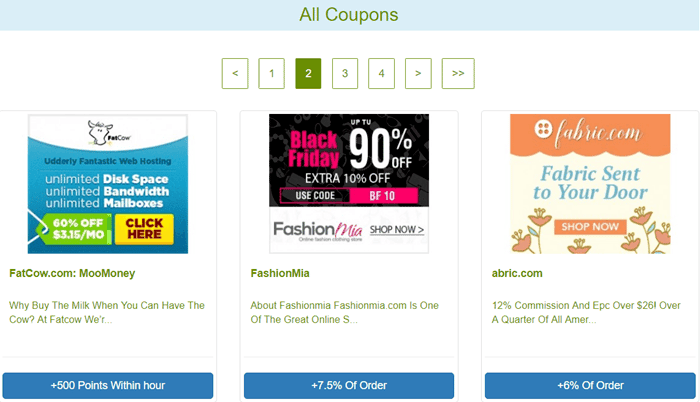 These are not actually coupons, but cashback offers from different companies. That means you will be able to earn a percentage of the price of the product when you click the link and purchase from their partners’ website. All you have to do is click the offer, visit the merchant’s site and make the purchase. Here you can earn points just for watching videos. Unfortunately, I am not able to review this section properly as here in Brazil there are no videos available. However, from previous experience with other GPT sites, I can say that the income potential is very low. If you find videos in your country, you should expect to earn 1 cent or even less per video. This section is where you will find online survey opportunities from survey panels like Samplicio. The first step is to answer a few pre-qualification questions that will select the right candidate for a study. The problem is that you will spend a lot of time answering these questions only to get screened out without receiving any points. In my opinion, online surveys is a good way to earn some quick pocket money, but it undervalues your time as you will make much less than the minimum wage. Most GPT sites allow users to sign up to other sites and accept trial offers in exchange for points. Although WonDough states on their site that you can earn points by registering on websites and installing apps, I haven’t seen this option. However, it’s likely that they will include it later as the platform grows. Another way to make money that is missing from WonDough is the referral program. The referral program in other GTP sites allows users to invite friends and family to join the platform through their referral link and earn commissions. It’s a win-win situation, so let’s hope Admedia offer this opportunity in the future. You will be able to redeem your points for Amazon, Starbucks, and Wallmart gift cards, and the minimum cashout requirement is $3. After you request your payment, you should receive the gift code in your email within 10 business days. The main drawback is that you can’t cash out via Paypal at the moment. WonDough is legit GPT site, but in my opinion, it needs some improvements. It still doesn’t give you as many opportunities as other sites, so it will probably take a while to reach the cashout requirement. I am not a fan of using GPT sites to make money online because the income potential is always ridiculously low. Since I started my affiliate site in 2015, I realized it could earn me a job-replacing income after some time so I could eventually quit my job. All I do is write articles that help my audience and promote products as an affiliate marketer. It’s very profitable if you know how to implement the right strategy! That’s why I decided to get proper training in affiliate marketing and learn from experts and successful internet entrepreneurs. If you want to learn more from the platform where you can get the best course and access to expert, I highly encourage you to check out my #1 recommended platform. It will help you build a site and grow a profitable affiliate business from scratch. No previous experience is required as the process is laid out in simple baby steps so that anyone can follow. And by the way, it’s free to join! Thanks for checking out this WonDough review, and I hope it was helpful to you. If you have any questions, feel free to drop me a message below.